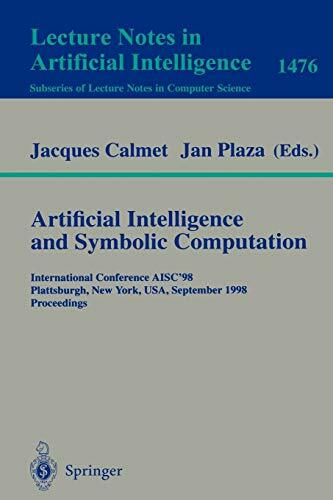 This book constitutes the refereed proceedings of the International Conference on Artificial Intelligence and Symbolic Computation, AISC'98, held in Plattsburgh, NY, in September 1998. The 24 revised full papers presented were carefully selected for inclusion in the book. The papers address various aspects of symbolic computation and formal reasoning such as inductive logic programming, context reasoning, computer algebra, proof theory and theorem proving, term rewriting, algebraic manipulation, formal verification, constraint solving, and knowledge discovery.